Let others feel happy during the bash of Diwali as you deliver them this Diwali Time Celebration Gift Hamper added with your love and affection. 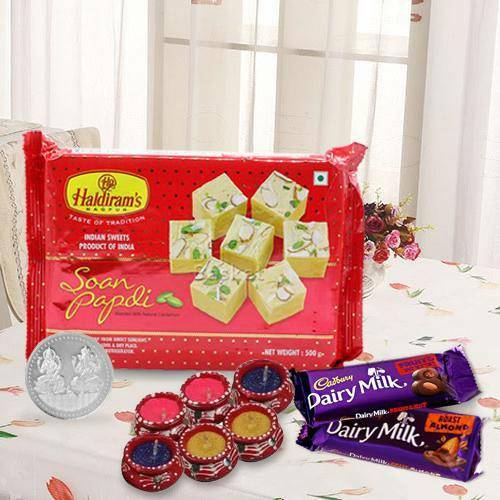 This exquisite festival of light Gift Hamper is sure to impress everyone around as it is loaded with Haldirams Soan Papdi (Net Weight-250 Gr), Wax Diyas (6 pc), Cadbury Dairy Milk Roast Almond Chocolate (1 Bar) and Cadbury Dairy Milk Fruit and Nut Chocolate (1 Bar). Flowers Delivery Khanna, Send sweets Agra, Wedding Cake Barmer, Diwali Mithai Kapurthala, Send Flowers and Gifts to Durgapur, Online Shop Shimoga, Flower to Phagwara, New Year Flowers Aligarh , Fresh Fruits Proddutur, Send Gift Gwalior, Dry Fruits to Bharatpur, Birthday Delivery Mysore, Sending to Guntur, Flower shop Vijayawada, Jalgaon Online Cake Delivery.